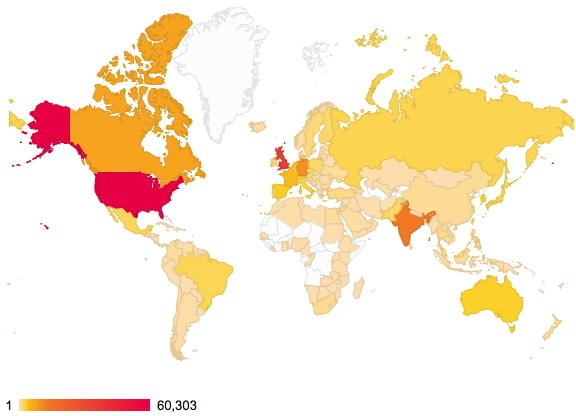 About two years ago, I posted on the distribution of readership of this blog. The passage of time has increased this from 144 to 176 countries. There are apparently between 189-196 such, so not quite yet complete coverage! Of course, it is the nature of the beast that whilst we can track countries, very little else is known about such readerships. Is the readership young or old, student or professor, chemist or not (although I fancy the latter is less likely). Another way of keeping tabs on some of the activity are aggregators such as Chemical Blogspace, which has been rather quiet recently. Perhaps we have become too obsessed by metrics, and with the Internet-of-things apparently the “next-big-thing”, the metrics are only likely to increase. This will only encourage “game playing“, and I urge you to see a prime example of this in the UK REF (research excellence framework), the measure which attempts to rank UK universities in terms of their “excellence”. Increasingly, our access to scientific information is becoming a research topic in itself. Thus an analysis of big deal journal bundles has attracted much interesting commentary (including one from a large scientific publisher). In the UK, our funding councils have been pro-active in promoting the so-called GOLD publishing model, where the authors (aided by grants from their own institution or others) pay the perpetual up-front publication costs (more precisely the costs demanded by the publishers, which is not necessarily the same thing) so that their article is removed from the normal subscription pay wall erected by the publisher and becomes accessible to anyone. As the proportion of GOLD content increases, it was anticipated (hoped?) that the costs of accessing the remaining non-GOLD articles via a pay-walled subscription would decrease. I was reminded of this article by Michelle Francl, where she poses the question “What anchor values would most benefit students as they seek to hone their chemical intuition?” She gives as common examples: room temperature is 298.17K (actually 300K, but perhaps her climate is warmer than that of the UK! ), the length of a carbon-carbon single bond, the atomic masses of the more common elements. Disambiguation/provenance of claimed scientific opinion and research. I reminisced about the wonderfully naive but exciting Web-period of 1993-1994. This introduced the server-log analysis to us for the first time, and hits-on-a-web-page. One of our first attempts at crowd-sourcing and analysis was to run an electronic conference in heterocyclic chemistry and to look at how the attendees visited the individual posters and presentations by analysing the server logs. A two-publisher model for the scientific article: narrative+shared data. I do go on rather a lot about enabling or hyper-activating data. So do others. Why is sharing data important? Computers 1967-2013: a personal perspective. Part 5. Network bandwidth. In a time of change, we often do not notice that Δ = ∫δ. Here I am thinking of network bandwidth, and my personal experience of it over a 46 year period. Computers 1967-2013: a personal perspective. Part 5. Network bandwidth. is licensed by Henry Rzepa under a Creative Commons Attribution-Noncommercial-Share Alike 3.0 United States License.